JetSuiteX is a public charter airline that flies out of San Jose's swanky private terminal on the opposite side of Terminals A and B. They already have routes from San Jose to Burbank, Bozeman (Montana), and Carlsbad. Now they are adding a new nonstop to Santa Monica. The flight will depart San Jose at 4pm and arrive in Santa Monica at 5:10pm on Mondays, Tuesdays, and Thursdays. On Friday the flight leaves SJC at 2:30pm and arrives are 3:40pm. Return flights leave at 7:50am and land in San Jose at 9am on Mondays, Tuesdays, Thursdays, and Fridays. Prices range from $99 to $219 each way. 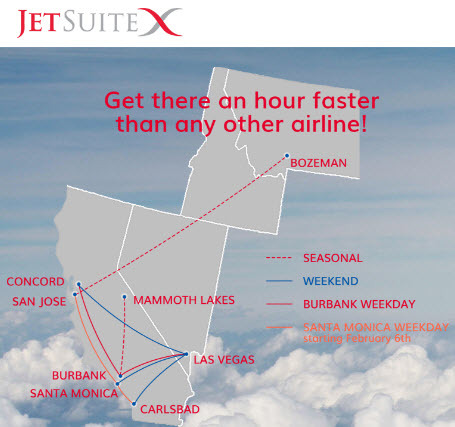 For more info, head over to the JetSuiteX website. Flew JexSuiteX to Burbank, was fantastic, will avoid flying SW anytime I can in the future for SoCal trips.